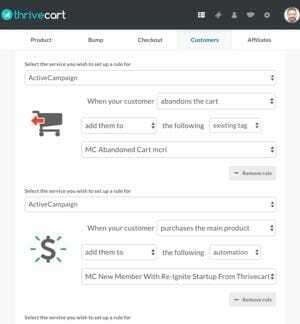 Thrivecart Review: Best Cart for Small Business and Marketers? Thrivecart Review: The Best Shopping Cart For Small Business And Marketers? Your shopping cart is one of the most important – yet often overlooked – components of your business. And that's true whether you're a solo consultant, a small business, or a fully fledged online marketer. Small changes to your cart to give it a higher converting design and make it an easier experience for your clients can have a huge impact on your sales. In this review I'm going to look at the most important features you need in ANY shopping cart, and then how Thrivecart stacks up against those criteria. Most of us, of course, start off with something simple like a PayPal button. But after a while you realise that you could increase sales and make your life a lot easier by investing in a proper shopping cart. In my time I've used a huge variety of carts: from dedicated carts like 1shoppingcart, Ultracart and Samcart through to the carts built in to tools like Infusionsoft, Ontraport and Membermouse. For the last 9 months I've been using Thrivecart – a new cart that's in the last stages of its pilot program. And I'm going to tell you up front that Thrivecart is by far the best cart I've used. Right now Thrivecart is in a pilot program so you can buy a lifetime license for a one-off fee of $595 (+VAT where applicable). That's a discount of over 70% on the full price and it's incredible value when you consider that other equivalent carts charge $199 per month and don't have all the features Thrivecart has. You'll need to sign up quickly as the lifetime license is only available during the pilot period before it launches to the public and switches to monthly pricing. When you're looking for a shopping cart, there are a number of factors you'll want to consider. The first and most important criteria is whether the cart is going to convert well (ie is it going to turn a high percentage of visitors into buyers). Most of your conversion rate is due to your offer and the way you describe it, of course. Along with testimonials, guarantees and other proof points you have. But the design of your cart is important too. A badly designed cart confuses your potential buyers and introduces “friction” into the buying process which lowers conversions. And if the cart doesn't work well on mobile you can expect to lose more sales too. Also important are features like upsells and “bump offers” which can add 20-50% to your average order value. Unfortunately, a lot of more traditional carts are wedded to an old-fashioned design that tends to look like it's been created to meet the needs of an accountant rather than maximise sales. So much so that many of the most successful online businesses have paid small fortunes to get manually tailored cart templates glued on top of their older carts. Thankfully, modern carts like Thrivecart and Samcart have high-converting designs and features like upsells and bump offers built in as standard, so no need to shell out for expensive customisation. Unusually for an online cart, Thrivecart also works with Apple Pay and Google Pay which smooths the process for buyers on mobile. A high converting cart is great, but if your transactions fail to process then you're in trouble. If you're active online you may have seen horror stories from some carts where transactions have stopped processing in the middle of a big launch. I've been using Thrivecart for both my and my wife's business for a couple of years now and we've run literally thousands of transactions through it without a single problem. The other thing to look out for in a cart – and this is something they'll very rarely tell you before you sign up – is the way they handle recurring transactions. Both the two major payment processors, PayPal and Stripe, allow you to set up subscriptions directly. That means that if for some reason you decide you want to switch shopping carts then the subscription payments keep on coming independent of the cart. Unfortunately, many carts don't use subscriptions inside your payment provider – they set up the subscriptions themselves. That means that if you decide to switch carts in future, the subscription payments will stop – ouch! A number of the carts I've used in the past have done it this way: the cart built into Ontraport, Ultracart, the cart built into Membermouse. Ontraport and Ultracart don't even set up customer records properly in Stripe for the transactions. Samcart does PayPal subscriptions using “reference transactions” which gives flexibility over billing amounts and schedules – but suffers the same problems if you switch carts – the subscription transactions stop. Worse: according to PayPal you shouldn't use reference transactions for subscriptions over about two years – after that, the subscription needs to be restarted. So if you're hoping to have long term customers there's a risk their payments will just stop after a couple of years with reference transactions. If all that sounds a bit technical, it is. The TL;DR version is “check before signing up with a cart to make sure they set up subscriptions properly in the payment processor rather than managing them themselves”. Luckily Thrivecart does it the right way. Next on any list of criteria for choosing a shopping cart is to make sure it integrates with the systems you use. Obviously, it needs to integrate with whoever you use as a payment processor. Thrivecart works with Stripe, PayPal, Authorize.net, ApplePay and Google Pay. Personally, I use both Stripe and PayPal. They're both easy to get set up with – especially for those of us in Europe where merchant account providers are shorter in supply and tougher to sign up with. If you're already signed up with Authorize.net you'll probably want to stick with them. It's certainly advisable to have more than one payment processor just in case you run into problems with the other one. Once you have a payment processor integrated, ApplePay just takes a couple of clicks to set up and Google Pay happens automatically – you just select it as an option. The next key integration is with your email system provider. At a basic level, you need to be able to add new customers to your email list, but ideally, you want rather more. If you're using an advanced email system like Active Campaign, Drip, Infusionsoft or similar you'll want to be able to add tags to customers or add them to automations rather than just adding them to a list. In other words you can trigger an action in your email system for pretty much any activity a customer does on your cart or related to their payments. Active Campaign, Aweber, ConvertKit, Drip, GetResponse, Hubspot, Infusionsoft, Mailchimp and Ontraport. I'm sure more will be added over time, but if you want to use it to its full potential right now, you'll need to be using one of these email systems. Digital Access Pass, Membermouse, Optimizemember and Wishlist Member. Thrivecart also has Zapier integration built in, so you can use that to integrate with external membership platforms like Teachable and Thinkific. Finally, Thrivecart also integrates with Slack for notifications, Demio for webinars, and Kunaki for CD/DVD fulfilment (though I've never used any of these features myself). So far I've covered the basics that every cart user will need. But there are other features that are critical for many of us, though not everyone will need them. The first of these is the ability to handle Digital Sales Tax/VAT. If you sell digital products to consumers (rather than businesses) in the EU you need to charge VAT at the rate of the country of the customer rather than the traditional method of charging VAT at the rate in the supplier's (your) country. You also need to be able to report the amount you've charged to your central VAT MOSS location. Frankly, this is a bit of a nightmare normally. Many shopping carts can't even handle VAT, let alone the complexities of digital VAT. Thankfully Thrivecart can and it's one of the reasons I switched to it. it also logs all your VAT collections and lets you run a report to make reporting it to your VAT MOSS much easier. Most other carts either can't handle digital VAT, or you need to pay for an add-on tool like Taxamo to do it for you. As your business grows you may want to start using affiliates to promote your products and services to allow you to scale quickly. Thrivecart has one of the most advanced Affiliate systems I've seen. You can control which affiliates can promote which of your products and set special payment levels for each one and per product. As well as the normal affiliate links you can create affiliate specific coupon codes that associate any user of the coupon to an affiliate. You get the usual reporting and admin centre for affiliates, and you can set up your system to give instant payment to affiliates when a sale is made rather than having to wait the normal 30-60 days – a huge bonus for your affiliates. You can also trigger behaviour rules when affiliates sign up (e.g. to sign them up for multiple products at a time) and when customers buy through specific affiliates. Other advanced features you might need are the ability to use Coupon Codes to give selective discounts and the ability to pre-fill fields in the checkout (for example name and email address) from links in emails or on your site to save the customer having to retype their details. Thrivecart, of course, gives you both. 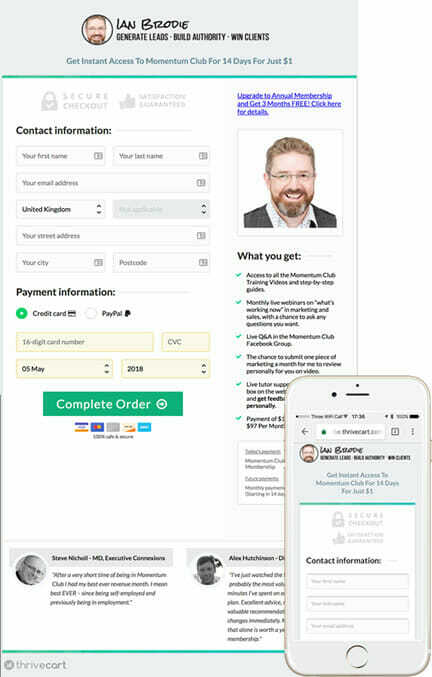 Thrivecart has a customer centre where your customers can update their card details, address etc – and full dunning features (sending reminder emails on payment failures etc) are in the pipeline. Thrivecart also recently added a JV feature to allow you to make payments to partners who have contributed to a product get a payment for each sale. As I said, we’ve been using Thrivecart in my and my wife's business for about 9 months now and it's one of the smartest decisions we've made. And since we bought during the pilot we got it for a one-off fee on a lifetime license (Samcart, by comparison, is $199 per month for equivalent features). Thrivecart had been adding features pretty much every month and that's set to continue when advanced dunning features are added this month (Jan 2019).